This review originally written for DVDTalk.com. 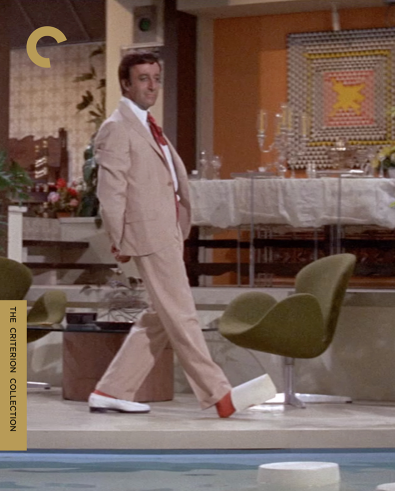 Peter Sellers reteams with his Pink Panther [review] co-conspirator Blake Edwards to cut loose and indulge their love of silent film comedies. The concept for The Party is something Chaplin or Keaton could have done wonders with, and though the movie does have quite a few verbal jokes, the majority of the more elaborate gags could run without sound and still inspire a huge round of guffaws. Sellers plays Hrundi V. Bakshi, a recent transplant from India to Hollywood trying to make his way as an actor. After a particularly disastrous day on the set, where Bakshi's clumsiness brings the production crashing down, a mix-up causes him to be invited to the studio head's glitzy soiree rather than be fired. From there, comedy ensues, as the good-natured Bakshi just tries to fit in. He loses his shoe, runs afoul of parrots and dogs, tries to communicate with starlets, and even learns to play pool from a cowboy actor (Denny Miller), who is the only person in the movie that has an accent more extreme than Sellers. The Party is a fantastic showcase for Peter Sellers' true talents. Not only does he completely lose himself in the role, but his physical agility as he traverses the many architectural oddities in the thoroughly modern home (inspired, perhaps, by Tati's Mon Oncle?) lets the actor show just how marvelous of a comedic athlete he is. The Party is one of those films I can watch a million times, and it never fails to make me laugh. I can even put it on while doing other things and check back in and out as the task demands, and every time I check in, I know it will make me smile. It's no hyperbole to call it a masterpiece. I should note, though The Party is very funny, it's not a gutbuster. The largely improvised comedy is of a kind that is observed and absorbed more than it is convulsively reacted to. As noted, it's more Chaplin and Tati than it is Jerry Lewis. Its slapstick is designed around character and as a send-up of the unnecessary conceits of the modern age rather than just silliness for the sake of being silly, and one could argue that The Party has likely aged better than most just for that reason.